It&apos;s a Tuesday afternoon, and I&apos;m sitting at my gently chilly HAT Central desk beside the best of Germany, Malaysia, Singapore, Lithuania, and the UK, thinking about startups and innovation. Oh, and I&apos;m a Canadian. I&apos;m not sure we start companies the way we used to (if we ever did). Where once we would get an office, hire a team for that office, raise a bit of money to pay them and then quietly get on with the job at hand, today it feels like we&apos;re cultivating a band of the (mad) willing - seducing them from wherever they call home. The HAT&apos;s mad band&apos;s "wherever" is all over the planet, and we&apos;re joined together by this mission, something I bet is true for a lot of modern organisations. Slack and Skype heal all wounds. We couldn&apos;t sit on our laurels, seeing such as the new norm. If the HAT is everywhere, our efforts and initiatives should be too, and with that in mind this month plans were hatched for a new initiative: the "HAT Global Innovation Fund (GIN)." GIN would be a global investment vehicle for startup entrepreneurs to receive almost £100,000 in in-kind services from the HAT. Our investment would be intended to couple with local cash investments from regional investors, and we&apos;re securing launch partners in Malaysia and Ireland to be those local moneybags. You can entrepreneur anywhere, these days - the learning, resources, even funding and research support you need are being offered across borders more and more every year. HAT resources will soon be the same, for any startup building with us anywhere in the world. Let&apos;s build new things in 2019. Plans were launched in November for the HAT Global Innovation Fund, a global investment vehicle for in-kind services from the HAT intended to couple with local cash from regional investors. It will launch first in Malaysia and Ireland - though these first partnerships have yet to be announced. GIN and local (Tonic) funding are intended to turn international entrepreneurs into established companies within 3-4 months of incubation, depending on the global partnerships to be signed. We had our first "full house sprint" ever this weekend. Representing Germany, Canada, Lithuania, Greece, Malaysia, Singapore, China, and Dorset, Surrey, Warwickshire in the UK, the team came together on pricing (we&apos;re cheaper now! ), strategy (creating global standards! ), bd strategy (flagship clients! ), and what&apos;s on in 2019. What happens when we die? The best possible records and memorials of the deceased are often held by surviving families, and limited to their hard copy assets (those that can be found and stored easily). In rare cases we&apos;re survived by more, but mostly we fade away and are left behind by the family that follows us. Wouldn&apos;t a more permanent, comprehensive record of who we were be interesting? The HAT is going to work on it in 2019. Internationally, a movement is gaining momentum for the standardisation of the medical or patient record. It&apos;s not news - EMRs and medical record standards have been hotly debated for over a decade - but we think we have a unique take. We&apos;re going to work with global partners in the new year to advance the pursuit of a standard of data in medicine and treatment through the HAT. 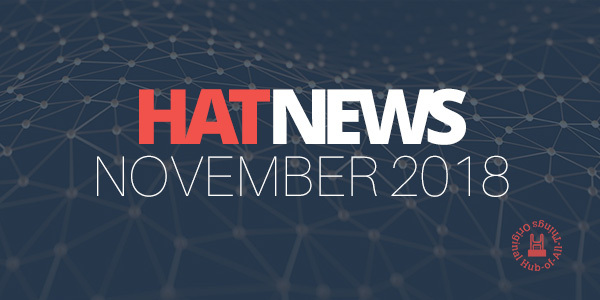 This year the HAT took a look at our monetisation strategy and decided on a shift in policy - new developers no longer need to be a member of the HAT Community Foundation to experiment on our technology. Up to a set number of HATs, anyone can build and try out how our microservers might change your business. Get in touch if you&apos;d like to take a poke around now that there&apos;s no costs attached. Our preachers, I mean innovation leadership, from the HAT Accelerator have begun supporting Warwick entrepreneurship training with programme direction in their undergraduate Business Model Evaluation module. It&apos;s nice to be giving back :) Get in touch if you&apos;d like some of our expertise wherever you live and work. 2018-2019 was a year for personal data innovation lobbying boy I sure tell you! The birth of the DCMS&apos; CDEI, a Royal Society chinwag, and increased support from the House of Lords&apos; AI Report has meant we&apos;ve been spending time in the seats of power. Thank you to everyone who&apos;s helpful in Westminster - lobbying for personal data rights and innovation is hard work, and it&apos;s starting to pay off.